When planning a visit to Cabin Creekwood, guests frequently ask us what there is to do. Although the list is long, here are three activities that always score well in popularity. Billed as the highest cascading waterfall east of the Mississippi River, Crabtree Falls is an impressive series of five waterfalls pouring their way down the mountain. 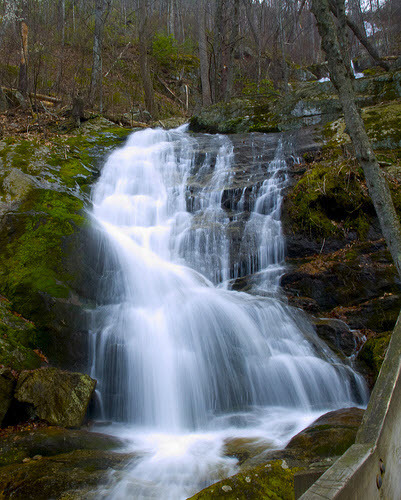 A hiking trail winds its way along the waterfall, stopping at numerous overlook points for amazing views of the falls. This waterfall can be enjoyed by serious hikers as well as novices. The bottom level is even accessible by wheelchair via a paved path that leads from the parking area. For those ambitious enough to make it to the top, an outstanding vista awaits, with scenic views of the mountains completely devoid of any sign of civilization. Crabtree Falls is located a 25-minute drive from Cabin Creekwood, and continues to be one of the most popular attractions for our guests. Appalachian Horse Adventures provides another way to explore the Blue Ridge Mountains. Kenton Dull and his team have created a wonderful opportunity to see the mountains, climbing to amazing views without expending the energy required to go on foot. His 40 years of experience training horses and leading trail rides make this an adventure that is sure to please. Children as young as six can participate in the shorter rides, while more experienced riders may choose up to 8 hours of horseback-riding adventure. For a taste of life in the old days, the Frontier Culture Museum in Staunton is a great place to visit. Located just 20 minutes from Cabin Creekwood, this popular attraction tells the story of early immigrants and their American descendants, through the relocation or re-creation of traditional rural buildings from Germany, England, Ireland, West Africa, and America. This museum shows how life in the United States today is shaped by its frontier past, and how what we know today as the traditional Appalachian farm was a blending of the cultures from four homelands.